I noticed the other day that there was a Cadman’s Montreal Bagels open now at the intersection of the Vanier Parkway and Montreal Road, so I thought that I’d try it out. 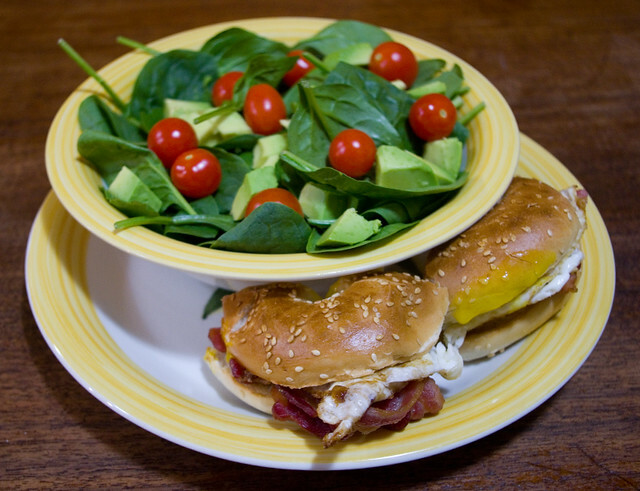 Bagels are a staple in our household, whether I make them myself or buy them from a bakery or grocery store. When I was a kid, my parents would take us almost every weekend for breakfast at Bagel Bagel at the corner of Clarence and William in the Byward Market, where I believe the Cornerstone Bar and Grill is now. I’ve also been lucky enough to visit Montreal frequently and try fresh bagels there from a variety of restaurants and bakeries. The signs outside of Cadman’s proclaimed that they were the best Montreal-style bagels in Ottawa, so I was intrigued. I purchased the All Day Breakfast Bagel Combo for $6.59 (plus tax), with an additional bowl of fresh fruit salad for another couple of bucks. The sandwich is on any of their freshly-baked bagels (I chose pumpernickel) and is topped with an egg, cheddar cheese, and bacon, and comes with a latke and a drink. One of the things that my photo fails to convey is how absolutely huge the portions are. The bagels here are especially massive. I came out of there stuffed after a late breakfast and didn’t need to eat again until dinner. 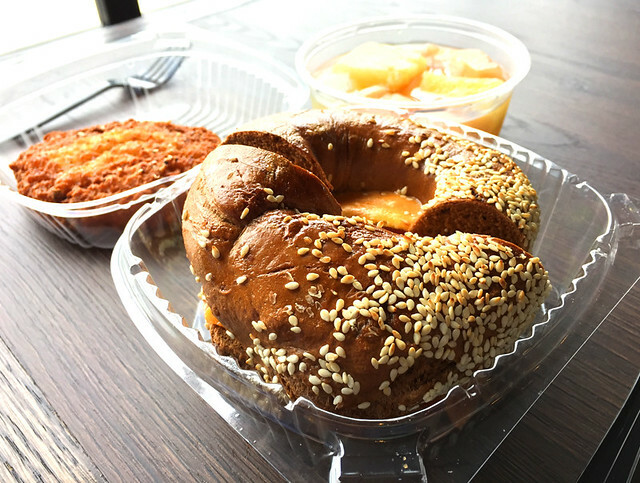 But are they the best Montreal-style bagels in Ottawa? Personally, I don’t think so. A good Montreal-style bagel is, to me, quite chewy, and these bagels were very soft. They also didn’t have the slightly sour tang that I associate with that kind of bagel. Perhaps they’re not working the dough long enough, boiling them long enough (or at all? ), or using a high-enough protein flour. Whatever the reason, these bagels are really light and fluffy. Now, I know that some people prefer theirs that way, and there’s nothing technically wrong with a fluffy bagel. However, to me a Montreal-style bagels should be chewy and dense. That being said, overall the breakfast was quite tasty, and it was good value for money. It wasn’t the best Montreal-style bagel I’ve had in Ottawa, but it was pretty good in its own right. So I’ll probably be back. Last night I decided to try to make bagels for the first time. I followed the “Bagels” recipe on page 26 of Baking Bread: Recipes From Around the World for the Complete Home Baker by Audrey Ellison (1995). The book itself is over twenty years old, but it is new to me — a thrift store find. I believe that this is the first recipe I’ve followed from it. 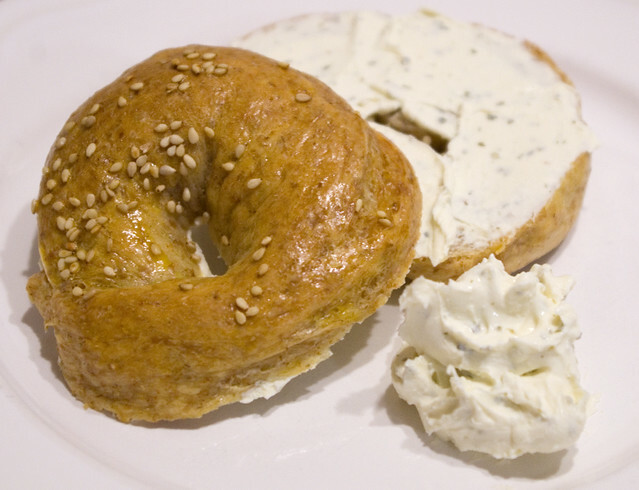 Whole wheat sesame seed bagel with herb and garlic cream cheese. All in all, I was quite satisfied with how my bagels turned out. They are slightly chewy on the outside and soft on the inside, which is exactly how I like them. They’re also smaller than their store-bought counterparts, perfect to serve my kids, and hey, an adult can always have two. My mother and I both liked them and thought they were worth making again, but my husband is more reticent. He prefers the chewier, denser, Montreal-style bagels. Oh well, more for me! Bagels before the last proof. 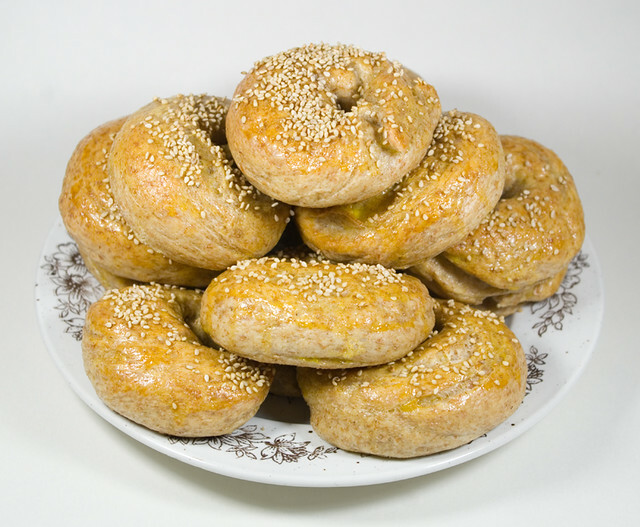 I learned a few things when making these bagels. First of all, if I’m going to shape the dough rings by hand (as opposed to extruding them or cutting them, like how they may be done in a factory), I’m going to need to do a better job of pinching together the ends. The instructions even warned that they would need to be firmly attached so that the rings would keep their shape. I thought I’d done it well enough, but apparently not. A number of my bagels were more U-shaped than O-shaped. 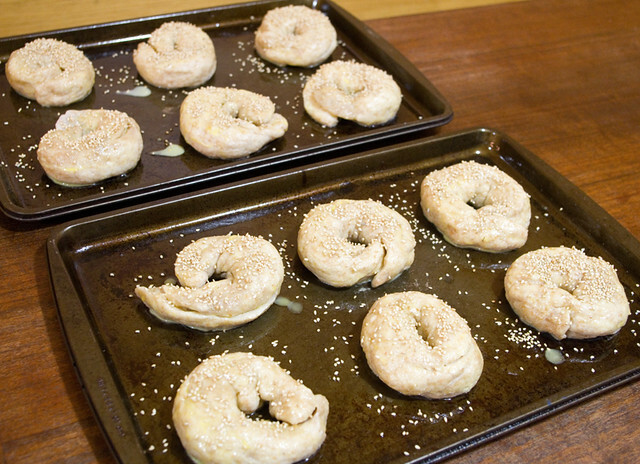 Boiling breads like bagels and pretzels effectively sets the crust before it goes in the oven. The water doesn’t actually penetrate very far into the bread because the starch on the exterior quickly gels and forms a barrier. 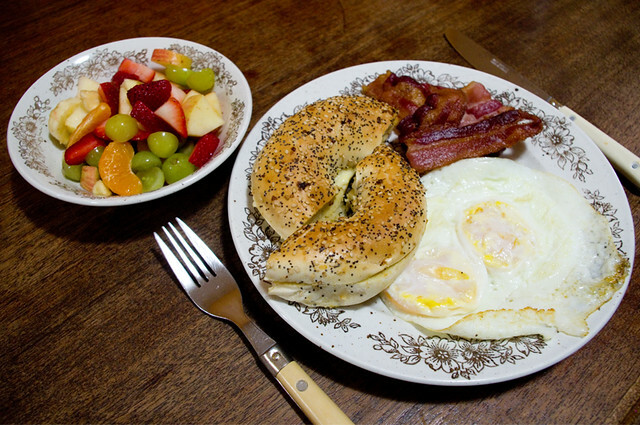 Bagels are typically boiled for 30-60 seconds on each side. The longer the boil, the thicker and chewier crust. Bagels ready to be baked. The last thing I learned is that there is an error in the recipe I used. 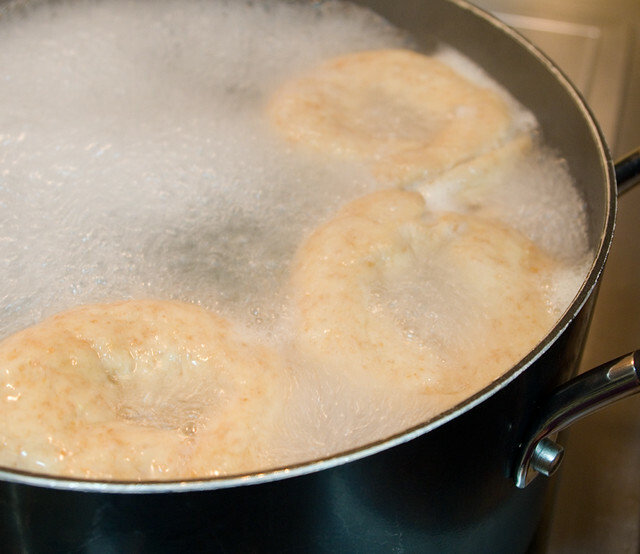 In the first step of the instructions, it says “dissolve the yeast in the water…” However, the only time there’s water in the recipe is to boil the bagels in. I actually measured out the water and added the yeast before I realized that the proportions were all wrong. I checked and double-checked the recipe; nope, I hadn’t read it wrong. It should read, “dissolve the yeast in the warm milk“. I started again with this correction, and everything else went according to plan. Would I make this recipe again? Definitely! I’d like to try different flavours; I’m partial to all-dressed bagels, and roasted garlic, and onion. It would be interesting to experiment with length of boiling time and protein level in the flour. 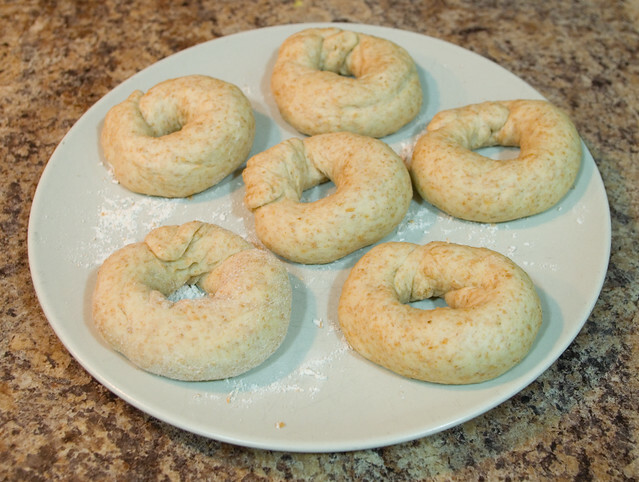 Perhaps I could learn how to make the chewier, denser bagels that my husband likes best. I’m not too worried if I don’t accomplish that, though. There are some lovely Montreal-style delis and bakeries in this city that I’m perfectly happy to have an excuse to visit.